The Total Addressable Market (TAM), also referred to as total available market, is the overall revenueSales RevenueSales revenue is the starting point of the income statement. Sales or revenue is the money earned from the company providing its goods or services, income opportunity that is available to a product or service if 100% market share was achieved. It shows the level of effort and funding that a person or company can put into a new business line. 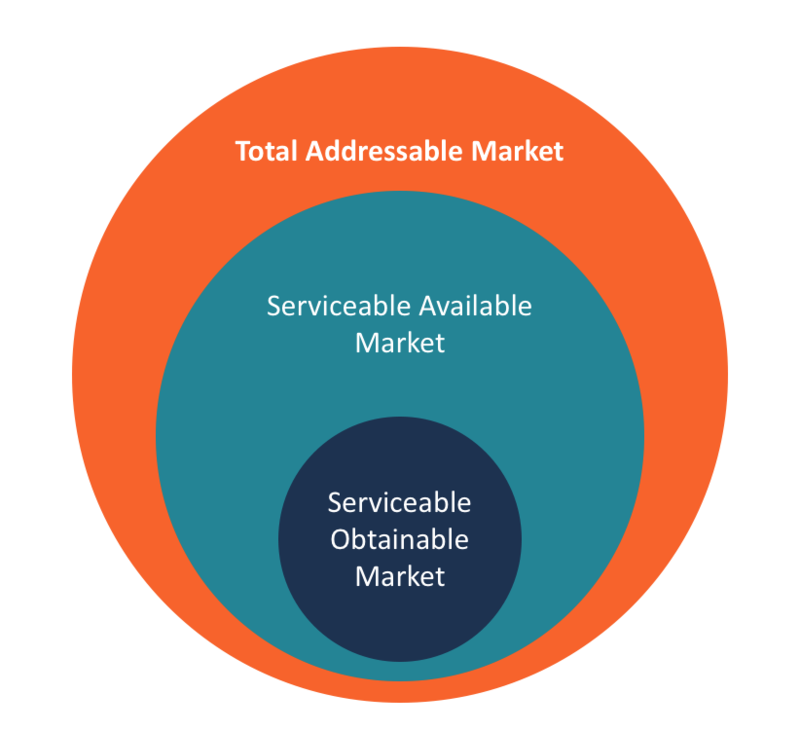 The concept of total addressable market is important for startupsStartup Valuation Metrics (for internet companies)Startup Valuation Metrics for internet companies. This guide outlines the 17 most important e-commerce valuation metrics for internet starts to be valued and existing businesses because the estimates of effort and funding required to allow them to prioritize specific products, customer segments, and business opportunitiesCorporate StrategyCorporate Strategy focuses on how to manage resources, risk and return across a firm, as opposed to looking at competitive advantages in business strategy. Where there are potential investors and buyers of the business, company executives can use TAM to provide a viable value proposition. Creating a viable value propositionValue PropositionValue proposition is a promise of value stated by a company that summarizes how the benefit of the company’s product or service will be delivered, involves estimating the market size, size of the overall investment, competition, growth expected and the available market size. All this can be achieved through TAM. For example, when a private equity firm intends to acquire a startup company, it can use TAM to estimate the revenue generation potential of a product or service offered by that company. TAM takes into account the products and customer segments that remain untapped by the startup. The assessment helps to determine the actual size of the available market and the prevailing competition for the products offered by the startup. The top-down analysis follows a process of elimination that starts by taking a large population of a known size that comprises the target market and using it to narrow down to a specific market segment. Top-down analysis can be represented by an inverted pyramid that shows the large population of a known segment at the top and the narrowed down segment at the bottom. The method uses industry research and reports to get the estimates of the population. An example is a start-up technology company that offers an app targeting small businesses that cannot afford premium accounting software. The company relies on industry research that shows that there are 1 billion businesses around the world, out of which 30% lack access to premium accounting software (30% x 1 billion customers = 300,000,000 potential customers). Research shows that 90% of businesses that do not use a premium accounting application employs an in-house full-time accountant. It brings the number of potential businesses to 10% x 300,000,000= 30,000,000. 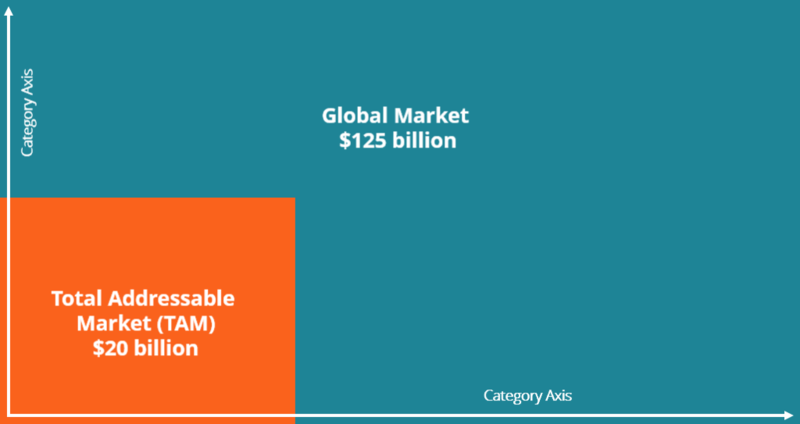 If the business is offering the application for free but with subscriptions of $100 per year, the estimated total addressable market is $3 billion (30,000,000 x 100). (All the figures used are based on assumptions). Bottom-up analysis is a more reliable method because it relies on primary market research to calculate the TAM estimates. It uses more reliable data on the current pricing and usage of a product. For example, for a startup company with a free accounting mobile app and annual subscriptions worth $100, it can take a reasonable estimate of the number of businesses in its target market to obtain the TAM. The advantage of using a bottom-up approach is that the company can explain why it selected certain customer segments and left others. The company relies on data from its research or survey and, therefore, the addressable market would be more relevant and accurate rather than when relying on inarguable data. Value theory relies on an estimate of the value provided to customers by the product and how much of that value can be reflected in the product pricing. A company estimates how much value it can add and why it should capture this value through the product pricing. Value theory is used to calculate TAM when a company is introducing new products into the market or cross-selling certain products to the existing customers. The value theory approach can be used to estimate Uber’s addressable value. Users opting to use Uber taxis enjoy the option of driving themselves, using public means or taking the competitor’s taxis. Since users are willing to forego all these alternatives and take an Uber taxi, the company can estimate the value that these users derive from using the Uber taxis and determine how to capture the value in its pricing. TAM, SAM, and SOM represent the various subsets of a market. TAM refers to the total demand for a product or service that is calculated in annual revenue. SAM stands for Serviceable Available Market, and it is the target addressable market that is served by a company’s products or services. SOM, on the other hand, is an acronym for Serviceable Obtainable Market, which is the percentage of SAM that is realistically achieved. Identifying these subsets within an industry requires some market research to understand the proportions of each area. An example is consumer expenditure on food in the UK. In 2014, the value of this market was estimated to be 200 billion euros, which represents the total addressable market. The consumer food market entails fresh food, alcoholic and non-alcoholic drinks. The alcoholic drinks industry, which served 49 billion euros, is the serviceable available market (SAM). The industry contains several large manufacturers and suppliers who service the market. A section of the alcoholic drinks industry that is served by one manufacturer is the serviceable obtainable market (SOM). TAM helps in breaking down these numbers into manageable levels. An investor should be objective in estimating the available market because an exaggerated value may lead to markets with less potential for growth. The ideal market for any entrepreneur is one with potential growth capacity. Financial modelingWhat is Financial ModelingFinancial modeling is performed in Excel to forecast a company's financial performance. Overview of what is financial modeling, how & why to build a model. A 3 statement model links income statement, balance sheet, and cash flow statement. More advanced types of financial models are built for valuation, plannnig, and requires building a forecast for a company, which is dependent on the company’s total addressable market. When developing or analyzing a forecast in a valuation modelValuation Modeling in ExcelValuation modeling in Excel may refer to several different types of analysis, including discounted cash flow (DCF), comparable trading multiples, precedent transactions, and ratios such as vertical and horizontal analysis., it’s important to perform a “sanity check” against the size of the market. Detailed operating models will typically include a build-up from market size to addressable market, to customers, and finally to revenue. Learn more about how to calculate the market size and market share of Amazon, Inc. in different global market segments such as e-commerce, advertising, cloud computing by taking CFI’s Advanced Financial Modeling & Valuation Course today!